For this week, I wanted to share that I am getting ready to publish a guided Journal called Upgrading Your Soul System Software. This is one of the illustrations/stories in it. I originally wrote it 12 years ago and it has been in a box on the shelf…but it s about to come out now! I’d love to hear what you think of this!!!! Here it is! When I first wrote this journal 12 years ago, the phenomena of social networking hadn’t yet happened. Now it is part of our lives and it makes this idea a bit easier to explain. 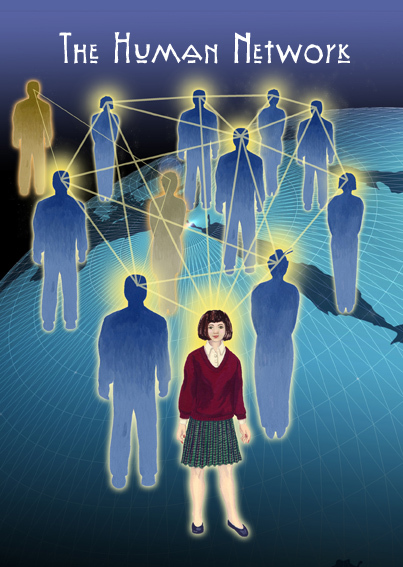 We certainly can connect via the Internet with a great number of people. Some old friends, some we don’t know at all … but we are all getting used to being connected. Even if you don’t belong to a social network, someone you know does and they pass that connection on to you via good old fashioned conversation. There is, however, another network that has existed with people on some level for all time. Consciousness to consciousness. The better connected we are with our higher self or higher consciousness, the better quality of information we receive…from people we know and people we don’t know. We have all had the experience of thinking of someone just before the call, right? Where do you think that thought comes from? From your higher self that is connected with their higher self! The quality of those communications is like the quality of your connection to the Internet. You may have a high speed connection to your house, but if the wireless modem that connects that to your computer is not good, or turned off, that great communication doesn’t reach your computer … or you. To fix your modem, you can go out and buy a new one. To fix your connection to your higher self or higher consciousness, you have to do that rewiring yourself. But it doesn’t have to be hard or take a lot of time. You can do this journal, or do the alignment technique described in the “Coming Into Focus” divider earlier in the journal. You can simply ask to be guided to the right book/webinar/teacher/lecture for you. There is no one solution for everyone as we are all very very unique. So if none of the things described in this journal are right for you, or just don’t click … don’t give up! Friends of like mind, of like energy are waiting to connect with you. And when you do connect with them, you will feel like you have come home … and you will have. Enjoy your journey as that is really the destination! Isn’t it interesting that the things we shelve come out later at the right time. Good for you. It looks like you have a treasure chest full of goodies!! Yes, this info to bring it out again came when Marilyn was here! 12 years ago I didn’t have the courage to move forward…now I do! Great for you!! And for the rest of the world too…!